Hello and Happy Labor Day! Have you visited our new Your Next Stamp Group on Paper Craft Planet? Just for joining our group, you will receive a special discount code to use at the Your Next Stamp Store. We also have lots of other fun things planned, so you don't want to miss out! Every Monday-Friday two of the Your Next Stamp Design Team Members will upload a YNS creation onto our PCP group. Mondays are my day, so I made up a fun little halloween card using one of my favorite Fhionas~Happy Halloween Fhiona. I just LOVE her and that super cute little ghost! Once again I used some fab Echo Park Paper~happy halloween collection and some yummy Black Jute Ribbon, Orange Velvet Ric-Rac, and Licorice Baker's Twine from Really Reasonable Ribbon. Also, today is the last day to get a free gift with every order from Your Next Stamp, so make sure you take advantage! Enjoy your day, and I look forward to catching up with all of your awesome creations that I've missed over the last few days! Cute card! I love Fhiona with purple hair. She's a cutie and all that ribbon/ric rac is fab! Okay...I HAVE to have some of that CUTE dp!! Super cute Halloween creation Kerri! 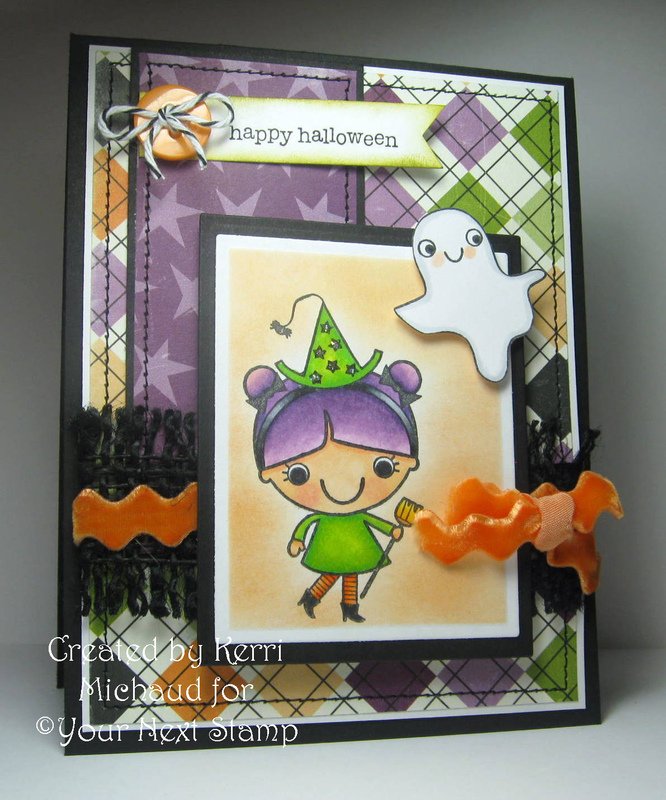 What a cute halloween card Kerri, super! Adorable card! I love the combination of the ribbons! Fhiona is so cute! This is adorable Kerri!! I so love your choice of background paper, the ribbons and your gorgeous coloring GF! Another adorable creation!! Your card looks like so much fun! The papers and stitching are so pretty too! This one brings a big ole smile to my face Kerri. You truly are the queen of sweet. Thanks for stopping by today and saying hello. I really appreciate it. Very cute! Love that little witch image too. Adorable and I love the way you used your ribbon. Love the color combo and those papers. I love this cutie witch Fhiona! Super duper cute card Kerri! Super cute! I like these papers too. I am not much on halloween, but this is too cute. Omgosh super fab! LOVE all the colors and halloween spooky goodness! Eeek! I like that black fringe with the layered on ric rac...and that you tied the ric rac - that's really cute too. Love her purple hair - - so witchy...and that she has a mouth - ha! LOVE this!! Those papers are great and your coloring is perfect!